The overall tone of the his post is clear: Banning Powerpoint from the classroom leaves teachers and students better off. Based on my experience with our blended learning Communication for Development MA and the discussions within our Glocal Classroom network of universities, I tend to disagree - not with the general sentiment that all of us have suffered through a more than fair share of bad Powerpoint presentations, but with the notion of a technology-free, disconnected classroom and the traditional learning environment it often represents. The busy end-of-term weeks are approaching fast, so I sort of skipped one link review and focused on other content instead (see below). But it also means that there are lots of interesting reads for being inspired over the weekend! Development News features an overview of the reflexivity turn in aid work; persistent problems with the Global NGO ranking; the challenges for educated women in the Middle East, the ‘university in a box’ in Rwanda, pharmaceuticalization of global health, why design for development is rather a band aid; lots of new social media and open data readings; the neoliberal political economy of Oprah, researching facebook’s filter bubble; and Academia features a bibliometrics manifesto, a study on the impact of Academia.edu. how to build your brand as an (academic) writer and the question whether we should ban PowerPoints form lectures (spoiler alert: I disagree…). 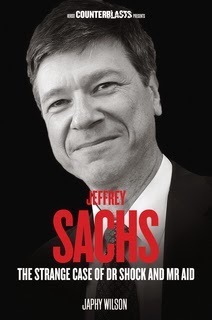 As the recent long interview of Jeffrey Sachs by Tyler Cowen confirmed, Sachs remains one of the most visible, discussed and engaging thinkers of international development. Japhy Wilson’s book Jeffrey Sachs-The Strange Case of Dr Shock and Mr Aid is a critical, thorough and detailed review of Sachs’s life and work that extends beyond dismissive blogs posts or snarky Twitter conversations. As paradoxical as it may sound, the book’s biggest strength is that it ultimately fails to deliver on exploring said conundrum. Daniel Esser and I are very happy to share our latest research publication with you! TED Talks on International Development: Trans-Hegemonic Promise and Ritualistic Constraints is probably the first research article that specifically analyzes TED talks on international development topics.